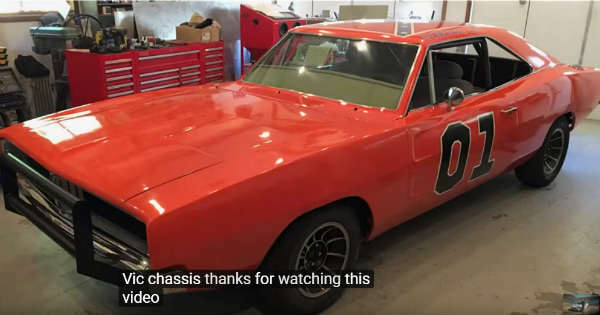 Police Car Transformed Into General Lee Dodge Charger & Jumped! - Muscle Cars Zone! Police Car Transformed Into General Lee Dodge Charger & Jumped! Over the years we have seen absolutely brilliant cars on certain movies and they have remained as a piece of legacy that people like to copy and have the same car as their own. But among all of these awesome and unforgettable cars, there is one that stands out and that is the General Lee Dodge Charger. This orange beast is something that literary anyone can easily recognize, as well as its numbers on the sides and the flag on the roof. Hereby many people used this awesome car for the purpose of performing stunts and jumps but finding one that is in perfect condition is fairly rare. Moreover, in this specific stunt the General Lee Dodge Charger had to perform the same jump twice, which is pretty difficult for such car. Then these guys came up with an ingenious plan to transform and turn over this police car, the Ford Crown Vic, into the mighty and legendary beast that is going to be able to perform the same jump twice without any problem. Hereby they needed a car with a low mileage such as this one. Furthermore, this car was made in 1999 and there plenty of which he could choose. Finding one such car is pretty easy when compared to the classic General Lee Dodge Charger. After weeks of hard work and determination, this car was finally ready and looked exactly like a normal General Lee Dodge Charger. What do you think, how successful were these guys in transforming it?